USL, Inc. announces the new product launch of the CMS-2200 Cinema Media Server with High Frame Rate (HFR). The advanced HFR media server supports JPEG-2000 decoding of 4K and HFR 2K images with state-of-the-art solid-state storage. USL, a leader in digital cinema technology products for the motion picture industry showcased the innovative, economical CMS-2200 at ShowSouth, in Atlanta, Georgia and BIRTV in Beijing, China. And will be on display at upcoming conventions, including ShowEast in Hollywood, Florida in October. The CMS-2200 has many features that include: JPEG2000 and MPEG2 decoding, AES-128 decryption/HMAC-SHA1, ingest through USB 3.0 or eSATA, two HD-SDI inputs and two HDMI inputs, sync input and output for dual projector large screen presentations, two Ethernet ports for live content streaming, auxiliary Ethernet control port, built-in 6 port automation, and 16 channels of AES-EBU digital audio. 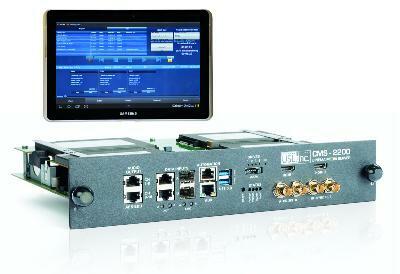 USL also offers an optional automation system with 12 outputs and 2 inputs for the CMS-2200. Managing the CMS-2200 is easily accomplished via the touchscreen Screen Management System (SMS). The SMS is cross platform capable for Android, IOS and Windows on both tablets and laptops. The CMS-2200 is a compact, projector-mounted unit that is DCI compliant and comes with a clear, concise operation manual for smooth, efficient installations. Founder, President and Chief Technical Designer, Jack Cashin, and his engineering team at USL, Inc. recognized the need for a full-featured “standalone” cinema media server that culminated in the creation of the visionary and inventive CMS-2200. “Our cinema media server gives digital cinema operators the capability of storing and presenting 2K, 2D & 3D movies in HFR, up to 60 frames per second,” stated Jack Cashin. 4K 2D movies can be shown at rates up to 30 fps. “We are also proud to say that the CMS-2200 is both FIPS and DCI compliant,” added Cashin. The Solid State Drives instead of standard mechanical hard drives will provide years of trouble free, maintenance free operation. With the CMS-2200, USL, Inc. continues to bolster its already extensive collection of digital cinema product offerings with advanced digital audio processors, monitors, crossovers, and accessibility solutions, audio and visual test equipment. USL has delivered more than 30 years of pioneering technical advancements for the motion picture industry.